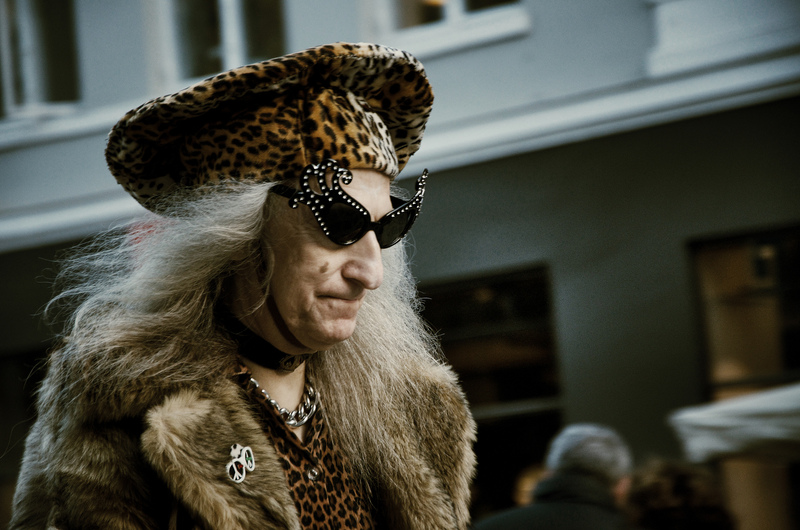 On my final day in Copenhagen out shooting street, I got a number of street portraiture photographs. This man suddenly appeared in front of me, I hadn’t much time to compose the shot. I admire people like this. It takes great strength and conviction to carry this look off and I feel he does it well. I got another of him as he walked off. He was wearing white shorts, white knee-high socks and black boots. I salute you, sir! And today is the last in the little series of iPhone photographs taken of people kissing. A nice way to enter this new week. This entry was posted in Daily posts to Flickr, iPhone, photograph posts, Street Photography and tagged All dressed up, art, Brendan Ó Sé, Copenhagen, Copenhagen Street Photography, iPhone, iphoneography, love, mobile photography, people, People kissing, photography, street photography, Style, travel, writing.